Wage Rudolf Supratman (March 9  1903, Jatinegara, Jakarta - August 17, 1938, London) is the author of the national anthem of Indonesia, "Indonesia Raya". His father was Monday, the sergeant in Battalion VIII. Soepratman of six siblings, one male, others female. One of them named Roekijem. 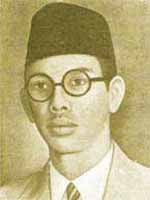 In 1914, joined Soepratman Roekijem to Makassar. There he was schooled and financed by the husband Roekijem named Willem van Eldik. Soepratman then learn the Dutch language at night school for 3 years, then proceed to Normaalschool in Makassar to completion. When he was 20 years, and then used as a teacher at School Number 2. Two years later he received a diploma Ambtenaar Klein. For a time he worked at a trading company. Of Ujungpandang, he moved to London and worked as a journalist. The work was still done while already living in Jakarta. In the meantime he became interested in the national movement and a lot of hanging out with figures of the movement. Resentment against Dutch colonialism started to grow and finally contained in the book Virgin Village. The book was seized and banned by the Dutch government. W.R. Soepratman not married and do not have a foster child. While living in Makassar, Soepratman get music lessons from her brother-namely Willem van Eldik, so good at playing the violin and then to compose songs. When living in Jakarta, on one occasion he read an article in the magazine arose. The author's essay challenging Indonesia music experts to create the national anthem. Soepratman challenged, and began composing songs. In 1924 was born the song Indonesia Raya. In October 1928 the Youth Congress held in Jakarta II. Congress gave birth to the Youth Pledge. On the closing night of the Congress, dated October 28, 1928, Soepratman play his songs are instrumental in the front of the public participants (in instrumental with violin on the advice Soegondo relating to Events and circumstances at the time, see Sugondo Djojopuspito). It was then that for the first time Indonesia Raya song echoed in public. All present astonished to hear it. Soon the song was popular among the national movement. If the political parties held a congress, the Indonesia Raya song always be sung. The song embodies a sense of unity and desire for independence. After Indonesia gained its independence, the song used as the national anthem Indonesia Raya, a symbol of national unity. However, the creator of the song, Wage Roedolf ​​Soepratman, did not get to enjoy living in an atmosphere of freedom. As a result of creating a song Indonesia Raya, he always hunted by the police the Dutch East Indies, until he fell ill in Surabaya. Because the last of his songs "Sunrise," in early August 1938, he was arrested when the broadcast of the song with the scout-scout on the road Nirom Embong Malang - Surabaya and detained in prison Kalisosok-Surabaya. He died on August 17, 1938 due to illness. Soepratman birthday, March 9, by Megawati as RI president, was inaugurated as the National Music Day. However, the actual date of birth is still debated, because there is an opinion stating Soepratman was born on March 19, 1903 in Hamlet Trembelang, Somongari Village, District Kaligesing, Purworejo regency, Central Java. This opinion is - in addition to the family supported Soepratman - Purworejo Court upheld the decision on March 29, 2007.